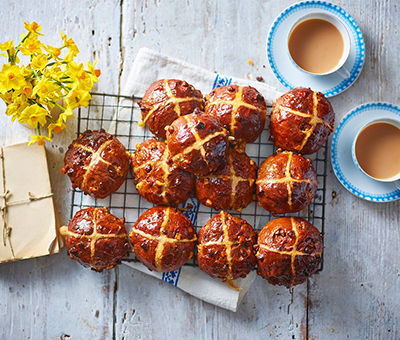 Try this delicious recipe to make hot cross buns this Easter with chocolate and orange. In a small bowl mix the yeast and 1 teaspoon of sugar and 4 tablespoons of water together, leave until frothy. Add the flour, sugar, salt, cocoa, mixed spice, both chocolate chips, candied peel and the orange zest to a large bowl, mix well with a wooden spoon. In a jug, stir the yeast mixture with the evaporated milk, beaten egg, melted butter and 200ml lukewarm water. Quickly pour in the wet ingredients from the jug into the bowl with the dry ingredients. The mixture will be sticky at first and then form a soft dough, use your hands to bring it together into a ball. Tip onto a floured surface and knead for about 5 minutes until smooth and elastic. (This step can be made in a stand mixer with a dough hook on a slow setting).Place the dough back into the bowl and cover with cling film, leave in a warm spot to prove for 45 minutes to an hour or until the dough has doubled in size. Tip the proved dough onto a floured surface and roll into 12 equally sized pieces. Place on a lined baking sheet in rows, leaving a space of half bun between each row (the dough will expand again when proving and in the oven so they can be pulled apart when cooked). Leave to prove for about 1 hour until double in size. Preheat the oven to 200°C (180°C with fan) Gas mark 6. Glaze the buns with some of the remaining evaporated milk. Mix the plain flour with 3 tablespoons of water and use to pipe crosses onto the buns. Bake the buns for 25-35 minutes until they make a hollow sound when the underneath of the buns is tapped. Warm the apricot jam in a small saucepan and brush onto the buns whilst still warm. Enjoy the buns whilst still warm. Why not try a white chocolate and cherry version? Add 100g white chocolate chips, 75g chopped dried cherries and 100g glace cherries.